Preschool thru 8th grade will use their Library time to read, research various topics and reinforce literacy skills taught in the classroom. 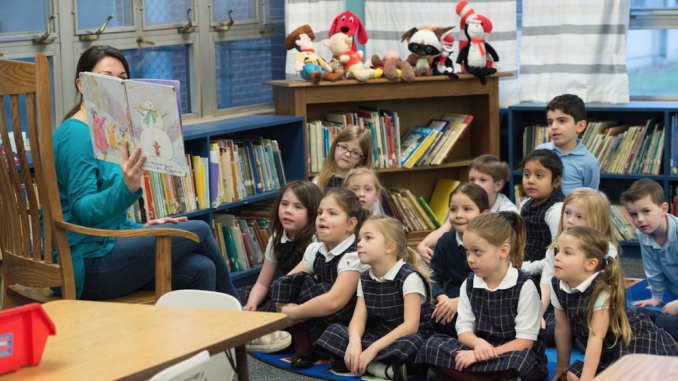 Our preschool students enjoy story time and songs during a weekly 30 minute time period. Our library program is often thematic and correlates with the preschool program. Our kindergarten expands on the preschool program of weekly thematic story time and how to check out a library book. They will learn how to find a book on their desired subject and how to find books by their favorite author. Our primary classes starts off the year with “a, b, c” order and then they will learn the parts of a story. Students at this level will do whole class projects and learn the basics of research in the library. Our intermediate students use the accelerated reading program for ten minutes each week. This is a digital program that is individualized by ability level and includes comprehension quizzes that help guide each child to improve their literacy at the instructional level. Our middle school students are preparing for high school, so they will get individual trimester projects. They work on research from various sources which include both paper and digital. Part of their library experience includes a mandatory presentation to the class. They also learn how to create a bibliography. The library program in middle school includes instruction in time management and executive function skills. The students are free to choose what they are going to work on and are expected to work independently and finish projects by the deadline. Our school Library is stocked with books, iPads, and a BriteLink projector so students are able to learn in various ways and incorporate technology. The Nonfiction section is organized using the Dewey Decimal System. The Fiction section is alphabetized by authors last name. The Fiction section is separated into three groups: Early (E), Early Fiction (EF), and Fiction (F). This makes it easy for the students to find books based on their reading level.